I consider reading and writing a big luxury. It was in the past and still is. Maybe more disciplined people than me manage to read and write daily or weekly, but for the past years, I never read more than 3 to 5 books a year. Shame on me, really. Also because I'm never happier and feel more fulfilled than with a book in my hands. I suspect those who read so much actually suffer from insomnia. Otherwise, I cannot understand how they find the time to read. I have no problem to fall asleep and that's my guess on why I never seem to find the time. Any tips from you on how to make time to read are more than welcome, seriously. Also, I guess it has to do with the fact that I organise my weekends around sports and social activities. Dale Carnegie's "How to Win Friends and Influence People". This is not my first time reading it - I read it in Spanish when I was 13, in English when I was 26 and now I read it in German. As a teenager what draw me to the book was the promise to make friends. My mother had it on her bookshelf and I took it one day out of desperation: I was very lonely and looking back I had only 2 real good friends that I still have now, but at the time we were not on the best of terms. I do believe this book changed my life and made me who I am now. Read this book - it will make you happier. Reading it in German has been comforting: I did learn something in the last 10 years struggling with the language. But that only confirms that my real problem with German is that I don't sit down and complete the basic grammar exercises and I never open Babbel on my phone. 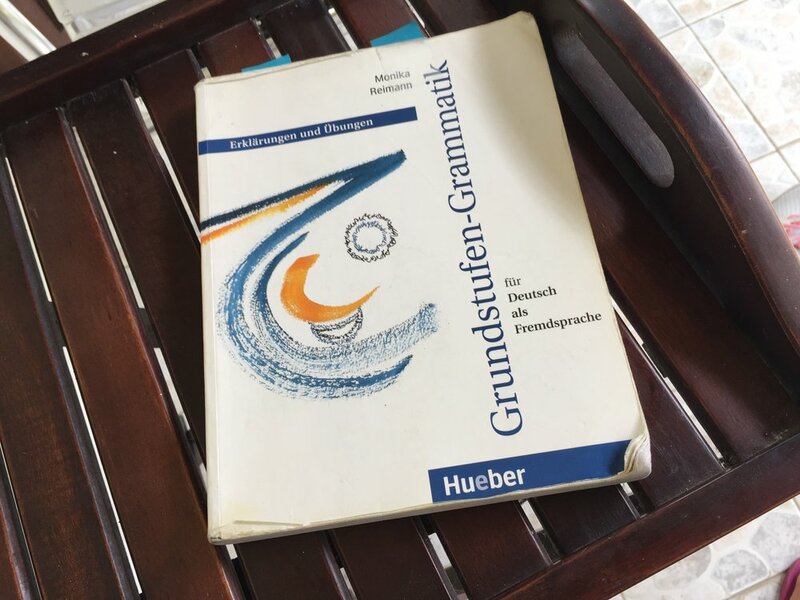 The German grammar book I bought 5 years ago and I never complete. "Superfoods" by David Wolfe. I found this book in one of the camping places we stayed in Australia. I had heard about it and it was recommended by friends when I became a big believer in good food. It's 400 pages or so, which almost half are recipes, but I couldn't finish it in 2 days - so I stole it. I know, I know: but in return, I promise to write a long post reviewing it, so many more people discover its awesomeness, and right after I will leave it behind at some other place to reestablish the order in the universe. Basically, it analyses the 10 top superfoods according to the author's experience and scientific research. Before reading the book I could already vouch for Maca, Aloe Vera and Coconut, but it opened a new world with its review of Algae such as Spirulina and AFA, and Marine Phytoplankton. They allow us to become healthy vegans, which until now I didn't truly believe it was 100% possible. An absolute must-read for anyone who wants to be healthier and take less meds. "Clean" by Alejandro Junger. The book that changed my health almost 3 years ago. I'm re-reading it as if it was my Bible and somehow it is. In my opinion, it is not only a health book, but a political one too. Because what you eat impacts yourself but also society and the market. The decisions of starting to eat other types of food and quit alcohol, red meat and coffee have an economical and environmental impact and I'm proud of being aware of it now much more than I was 3 years ago. I'm now almost 2 months alcohol-free, except for a few drinks in Sydney. My record still stands at 4 months without drinking. And it's a revolutionary change, I tell you. "Sapiens: A Brief History of Humankind" by Yuval Noah Harari. For years I've been willing to learn a lot more about History. Almost every day I'm confronted with the fact that I really don't know lots about the topic. The educational system in Spain is not the worst worldwide and I actually went to a great school. But one definitely doesn't cover enough while at school, high school and University, unless you happen to major in History. And when you move to Germany, it's impossible to escape how little you actually know. So before getting on a plane to fulfill my wish of reading more, I scouted the Internet on my search for the best and most comprehensive books about History. I ended up with a list of almost 50 books people rave about, and I'm determined to read most of them, if not all. The one that kept popping up in all lists was Sapiens and now I know why: in the first 60 pages I read, I learned more about humankind and the history of who we are than after years of school. I wonder if this book is now compulsory read in all schools, I think it should be. Here you find it in German. Read Sapiens if you want to understand humans and the world. And as a side note, something wonderful happened: Sapiens is the first book ever I read on an e-book device. It took me this long to actually go for it! After yet another moving experience in which one-third of my boxes were books, I finally decided to bring my reading to 2016. As much as I enjoy pages, I'm traveling the world and there's almost no space for heavy books. Before departing I checked for "the e-book" and asked friends for reviews. Most said that the Kindle Paperwhite changed their reading experience and habits. I trust them and probably it's the best e-book in the market. But you know I'm always saving money in my mind and I was afraid to spend too much money on yet another device I wouldn't use enough (it happened to me with the iPad). So I went for a cheaper ebook reader, the Tolino Page, which costed me 70€ in Saturn. So far I'm proud of my reading habits progress. I hope to write a much longer list of awesome books in 2017, but Rome wasn't built in a day and I have to split my time with writing too. I'm living a hell of a life, I know! Which books should I read in 2017? Tell me about what I'm missing out!